Construct a unique world map and story by carefully placing artifacts. Explore areas in any order, encountering nearly 70 different gameplay scenarios. Battle enemies in real-time with special attacks and customizable controls. Control every aspect of your new world: raise faithful pet monsters, create powerful golems, forge mighty weapons, and refine magical instruments. 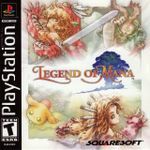 Adventure with a friend by having them import their Legend of Mana character from a Memory Card, or take control of an NPC.